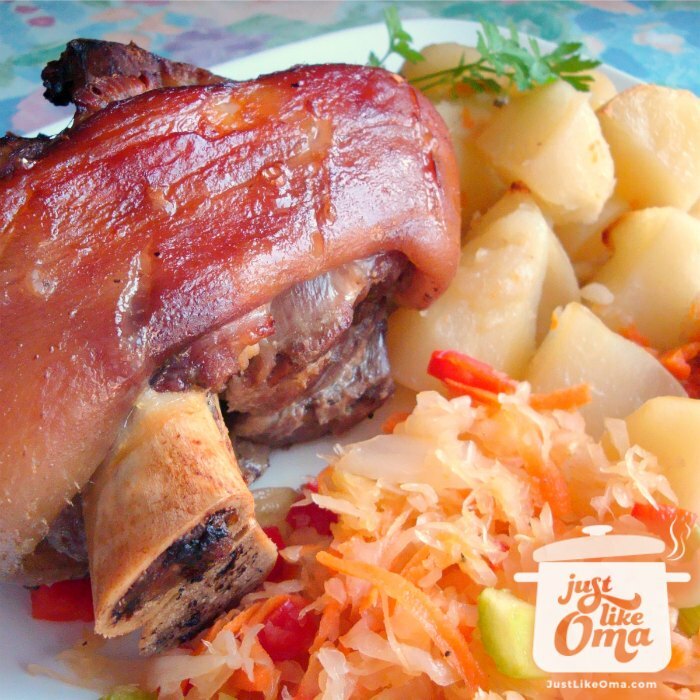 Learn how to cook Pork Hocks, not just for Oktoberfest, but anytime you want something traditionally German and wonderfully delicious! There are two main methods for cooking pork hocks. This one uses both cooking on the stove and finishing off in the oven. May sound like extra work. It really isn't and the results are worth it! This is REAL German food, Oktoberfest style! Called Eisbein in northern Germany and Schweinshaxe in the southern part, it is cooked from fresh ham hocks rather than smoked hocks. 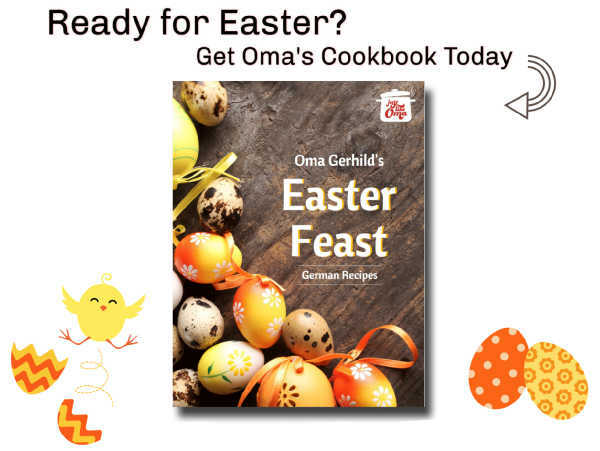 German recipes don't get much better than this! Put vegetables, 1 tsp salt, 1 tsp peppercorns, and pork hocks in pot. Add water to cover, bring to boil, reduce heat to simmer, and cook until hocks are just tender - about 2 - 3 hours. Do not overcook. Drain, keeping vegetables and cooking liquid. To baking dish (if cast-iron pot is use, add 2 Tbsp of oil), add drained pork hocks, drained cooked vegetables, and a small amount of the cooking liquid. Keep the extra drained liquid from cooking the pork hocks. Use what's needed for the roasting process. Let the rest cool and refrigerate. Skim off the congealed fat and use the broth for soups or stews. The other way to make this is just to roast it. Both are traditional and have their own followers, each claiming their pork hocks are the best. When you buy the fresh pork hocks, try to find the meatiest ones you can. Depending on the size of the hocks, one to two meaty hocks will feed about three to four people. Served with boiled potatoes and sauerkraut, you've a traditional Oktoberfest meal. 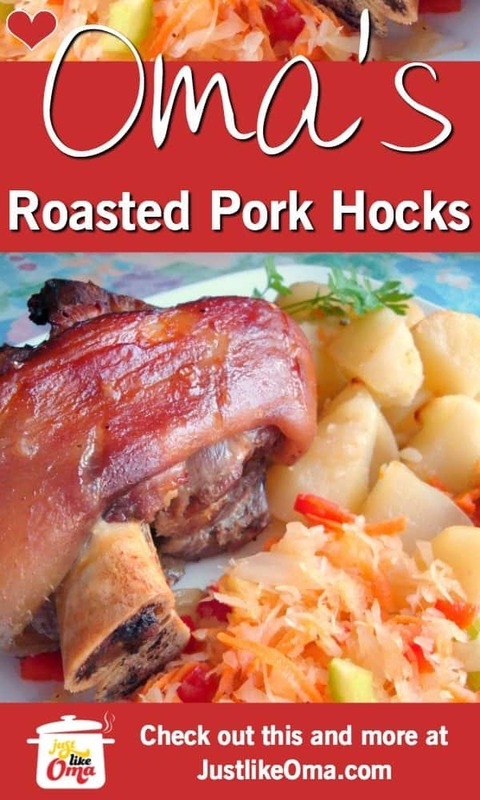 Check the fresh pork hocks to see if there are any hairs on the hocks before you cook them. If there are, the easiest way to get rid of them is to singe them off. Light a candle and hold the "hairy" hock over the flame, and the hair will "melt away". Smoked pork hocks are great, however they will make this dish taste like ham. If you want the traditional "pork hock" dinner, the type you get at Oktoberfests, then buy fresh pork hocks. 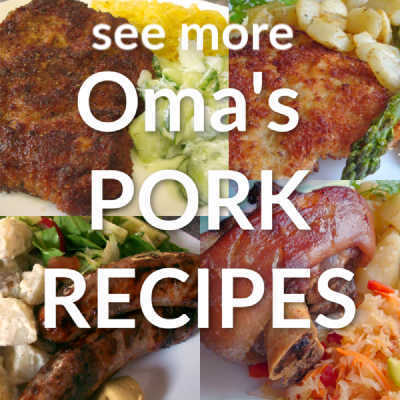 PIN the following post so you'll be ready when you're pulling out your cast iron dutch oven or your big baking dish to make Oma's Pork Hocks recipe for your Oktoberfest party ... and want to share it with others! "For the Lord sees clearly what a man does, examining every path he takes." Learn how to cook pork hocks, not just for Oktoberfest, but anytime you want something traditionally German and wonderfully delicious! A hearty meal any time of the year!